Inès Abdel Razek answers 12 frequently asked questions on life in Palestine. Despite several decades of media coverage, many people, including the well-educated, are ignorant about the reality of life in Palestine. This isn’t an attempt to explain the Israeli-Palestinian conflict in its entirety. And it is not a travel guide. A view of the Separation Wall along the West Bank. Q: When you say Palestine, where exactly do you mean? By Palestine, I mean the occupied Palestinian territory (oPt), including the West Bank, Gaza and East-Jerusalem (see comprehensive interactive map ). 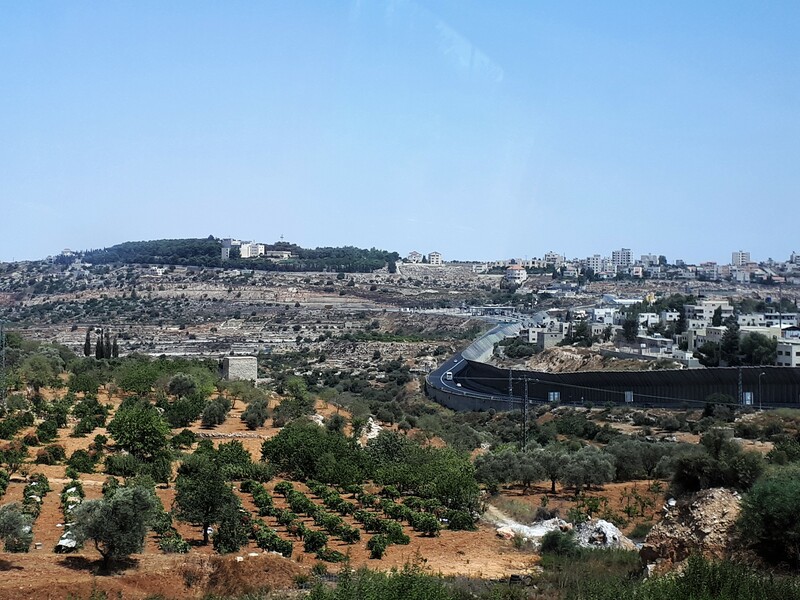 Under the terms established by the Oslo Accords (aka the 1993 peace agreements), the West Bank was divided into three areas: Area A constitutes 18% of the West Bank territory and was put under the civilian and security control of the Palestinian Authority (PA). Area B constitutes 21% of the West Bank and is under the civilian control of the PA and Israeli military control. Area C takes up 61% of the West Bank and is under full Israeli control. Q: What language is most commonly used by Palestinians and between Palestinians and Israelis in Jerusalem? Palestine’s official language is Arabic. Most Palestinians speak good English as a second language. Most Palestinians in Jerusalem and Palestinian citizens of Israel learn some Hebrew at school. As most Israelis do not speak Arabic, however, Israelis and Palestinians generally communicate in Hebrew or in English. Q: What currency is used in Palestine? Are credit cards used there? Palestinians don’t have their own currency as the occupation and current regime (under the Oslo Accords economic protocol of 1995 – aka the Paris Protocol) prevents them from having an independent central bank. The Palestinian economy uses and depends on the New Israeli Shekel, and it is subjected to the fluctuations of the Israeli market. Most banks and shops also transact in U.S. Dollars and Jordanian Dinars. However, Palestinian banks do exist and operate in the West Bank and Gaza. Credit and debit cards, as well as cheques, are also used, but not as widely as they are in Europe or in North America. Most small shops and restaurants will only accept cash. The violence that exists in most parts of Palestine is indirect, verbal, and psychological. There is direct physical violence, for which Palestinians, rather than foreign visitors, are the primary target. Gunfire, military violence and injuries occur in concentrated and limited areas. Most violence is related to the occupation i.e., between Israeli military forces and Palestinian protesters and their families. Within Palestinian society, however, there is very limited violent crime. Indirect violence occurs in various forms: intimidation, restrictions, systematic oppression through checkpoints, searches, and physical obstructions, land confiscation, control of water resources, home demolitions and so forth. You live in Hebron’s city center and face intimidation from Israeli settlers and the army. You live near an Israeli settlement in the West Bank and you risk being attacked by settlers when walking by. You participate in Friday demonstration at Bil’in or another location where organised protests are taking place (occasional violence from the Israeli army includes the use of tear gas and live gunfire). You participate in demonstrations at checkpoints or in Jerusalem that often lead to violent repression of protesters by the police. As a foreigner, you can easily avoid, and even ignore or be oblivious to, direct violence if you are aware of these violence-prone areas and stay away from them. Nevertheless, people must bear in mind that despite the abnormality of their situation, Palestinians are ordinary and resilient people whose daily urban lives are often not dissimilar to the lives of many people living in other countries. Palestinians go to work, drive, walk, and go grocery shopping. They visit friends and family, and eat out in restaurants and cafes. They use the internet and are connected on social media. Just like you. Q: Why do Palestinians who want to go to the West Bank need a visa from Israel? For most people in the world, traveling or being at home is a relatively straightforward concept. When it comes to the situation in Israel and Palestine, however, it is more complicated. If you are Israeli or a Jewish person of any nationality, you have the right to visit and live in Israel freely. If you are non-Israeli but of Jewish faith, you can visit under a normal tourist visa, but in addition, under the Israeli ‘law of return’ you are also entitled to acquire Israeli nationality and are entitled to logistical and financial support from the Israeli government should you decide to move to Israel. It is called the Aliyah. The only area of Palestine in which Israelis are not allowed is in Area A of the West Bank. Because Palestine is an occupied territory and is largely controlled by Israel, Palestinians do not have the same basic human rights as Israelis. 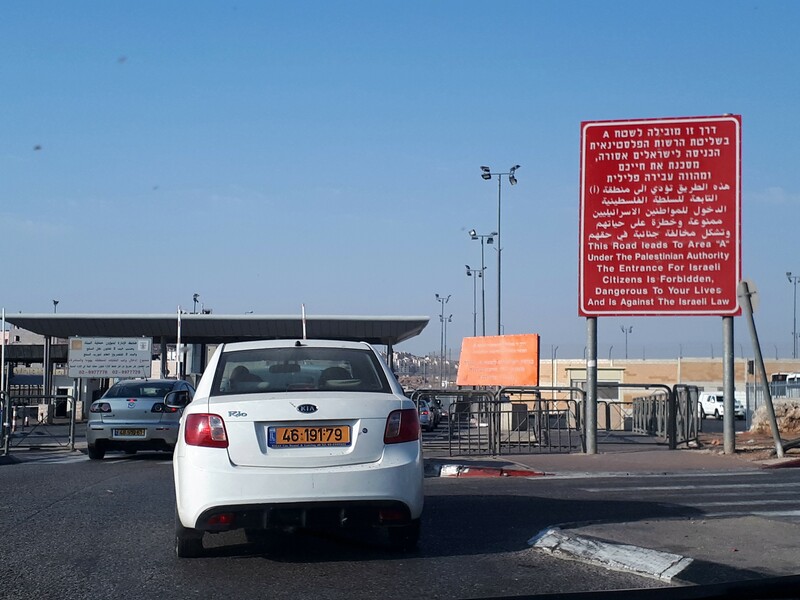 In order to enter either the West Bank, Gaza or East Jerusalem, Palestinian must pass through an Israeli-administered border, Israeli immigration authorities and national security. As a Palestinian, your right to enter, visit, work or live in the West Bank, Jerusalem or Gaza depends on your status, i.e., where you were born and where you live. Check out this great infographic on the issue. Q: Is there an airport in Palestine? Where do you land? No, there is no Palestinian airport. Palestine is under Israeli military occupation. This means that it does not control any of its borders, nor does it control its own airspace. People wishing to get into Palestine must pass through an Israeli-controlled border, and Israeli immigration and security checks. The two main options are to land in Tel-Aviv, Israel (Ben Gurion International Airport) or in Amman, Jordan (Queen Alia International Airport). Landing in Israel is the easiest option for those who have the right to. Most people holding foreign passports have this right while most people with Palestinian identification do not. The border between Jordan and the West Bank is situated approximately 45 miles away from Amman’s airport and you have to cross it by road, changing cars between one side of the border and the other. It is also controlled by Israel. Q: Are there any places in Jerusalem restricted to certain religions? Jerusalem is divided by what is commonly called ;the Green Line’ (the 1949 armistice line). East Jerusalem, which includes the Old City, is occupied Palestinian territory and West Jerusalem is on the Israeli side. In practice, the whole of Jerusalem is controlled and administered by Israel, so you are unlikely to notice which side of Jerusalem you are on when you are there. The Old City is a concentration of holy sites for the three monotheistic religions: Judaism, Christianity, and Islam. The al-Aqsa Mosque compound (including the al-Aqsa Mosque and the Dome of the Rock), known as the ‘Temple Mount’ to those of Jewish faith, is accessible to non-Muslim tourists in between times of Muslim prayer. However, non-Muslims tourists are not allowed to pray there. In theory, entry to the site is controlled by the Islamic Trust (waqf). In practice, however, the Israeli military maintains checkpoints directly outside all access points to the site. Both Palestinian and non-Palestinian Muslims who have a permit to enter Jerusalem are allowed to visit and pray there. Many Palestinians, however, are not given permits to enter Jerusalem, or to pray at al-Aqsa. The Western Wall (known as the Kotel to Jews and al-Buraq to Muslims) is accessible to people of all faiths and the site is guarded. The Israeli military controls access to this site. The Christian holy sites, such as the Church of the Holy Sepulchre, are accessible to visitors of all faiths. In times of relative peace, Palestinians and Israelis cross between East and West quite often, for shopping, entertainment and health reasons. But there is a de facto mistrust, and generally Israelis and Palestinians remain in their respective areas in a climate of tension. For example, it is not uncommon for an Israeli taxi to refuse to go to the eastern part of the city. There are however Jewish settlers, who deliberately move among Palestinian populations, and illegally take over Palestinian-owned houses in an attempt to claim the eastern part of the city as belonging to Israel. Q: Can you visit Gaza? Gaza is bordered by Israel and Egypt. There has been an Israeli-imposed blockade in Gaza since 2007. This has restricted the movement of goods and of people, causing a dire humanitarian situation, that risks seriously collapsing. Egypt maintains the border, which is closed for most of the year and special justification is required to leave the territory. In order to enter or exit Gaza, you need professional justification (humanitarian worker, journalist, foreign diplomat, or United Nations staff). Israel delivers very few permits to enter or exit Gaza. For Gazans, special permits are also needed, but these are often refused. Gaza’s Southern Border with Egypt (the Rafah border crossing) is also closed most of the time but Egyptian authorities open it in rare circumstances. Q: Can Israelis visit Palestine? Israelis, by Israeli regulations, are not allowed to visit Area A of the West Bank, which represents 18% of West Bank territory and is the zone entirely controlled by the Palestinian Authority. The photo below shows the sign to the entrance of zone A. Areas B and C are under Israeli military control and Israeli settlers live and circulate in these areas. Israel has built a road system in the West Bank for Israelis. Palestinian use is heavily restricted. Q: Is Palestine on the coast? The Gaza Strip runs along 25 miles of Mediterranean coastline. As a consequence of Israel’s ten-year blockade and over-pumping of the underground water aquifer, along with poor sanitation and an electricity crisis, the beach and the sea are heavily polluted. Some of the Israeli part of the coastline is historically populated by indigenous Palestinian populations and is made up of Palestinian towns and villages. Palestinians who can access Israeli territory are able to enjoy hanging out on these beaches. These include notably the coastline around Jaffa, Haifa and Akka (Acre). Q: Do women have to wear Islamic headscarf? No, wearing the headscarf is an individual choice. The Palestinian population is predominantly Muslim and Islam is recognized as an official religion, but there is a prominent Palestinian Christian community who are recognized as equal before the law. The vast majority of Jewish Palestinians became Israeli after 1948. While the legal and judicial system is inspired by Shari’a law, the Palestinian Constitutional text (Palestinian Basic Law) protects freedom of beliefs, freedom of expression, equality before the law, rule of law and human rights. Most of the judiciary system in the Palestinian Authority-administered territory is a mix of various layers of systems inherited from the periods of Ottoman, British, Jordanian, and Egyptian rule. Palestinian society is secular and wearing the veil is not a requirement. Nevertheless, Palestine is still a conservative society where people dress modestly, and therefore women are expected to wear modest clothes in public (covering shoulders and knees). It is appreciated when tourists respect the culture by avoiding mini-skirts and deep cleavages, for example. Except when at a mosque, foreign women who are simply visiting are not required to wear a headscarf anywhere. In Hamas-controlled Gaza (since 2007), the political Islamic movement has made it more difficult for women to dress and act freely. Q: Is Palestine a good tourist destination? Once you are able to cross the Israeli-controlled border, Palestine is a great tourism destination and really worth the trip! Not many people know that Palestine is ranked the number one fastest-growing tourism destination in 2017 by the World Tourism Organization. While there are still not many written guides (the only reasonable one is a 2011 Bradt Guide), people interested in visiting Palestine can start by checking out the official government website at VisitPalestine. For cool tips and personal experiences, go to Paltrips and That’s Ramallah baby. There are also multiple responsible travel agencies and groups that organise tailored tours, notably the Alternative Tourism Group. For hiking, go to Abraham Path, and Walking Palestine. Yamsafer is a good gateway into booking accommodations. With the author’s permission, this is an edited version of an article that first appeared on Mondoweiss on October 11, 2017.